Polly Edsell trained at the Royal Central School of Speech and Drama. 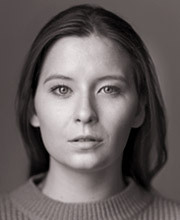 Her theatre credits include Caroline in Rebel Angel, directed by Angus Graham-Campbell, Laura in Put Him Down at Theatre 503 and Amanda in The Forest, as part of the Slam Soaps new writing festival at the Arcola. Her film work includes I Woz Drunk and Two. During her training she played a variety of roles including Rosalind in As You Like It, Joan in After the Dance and Ruth in 13. Before training Polly graduated from Bristol University with a degree in French and Italian.